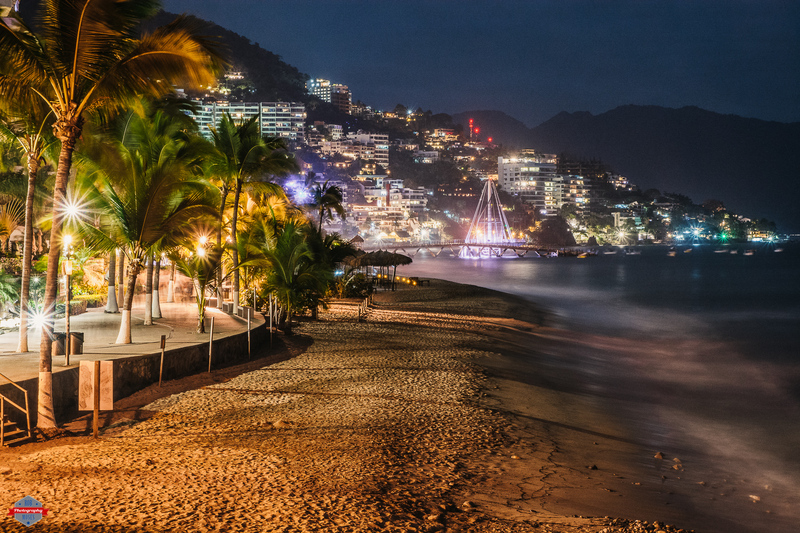 When I was in Puerto Vallarta in the spring I took many late night strolls around the city. The night I found my self at this location I had just been there earlier on in the day time. During the day the beach was packed and there were people everywhere. Even thought I like a crowd, I thought the picture might be more unique with an empty beach at night. For me the thing that makes this photo fun to look at is all the buildings and house going up the side of mountain behind the beach. The mountain even farther behind that is also a nice touch. This entry was posted in Architecture, Cities, Travel and tagged apartments, architecture, beach, beautiful, building, city, City Life, city lights, D7100, downtown, explore, hotel, hotel zone, inner city, lights, long exposure, Mexico, mountain, mountains, Native American, night, Nikkor, Nikon, ocean, palm trees, Photography, pretty, sea, street, Tamron, Tlingit, Travel, Urban, vacation, views. Bookmark the permalink. Ya it’s a great spot hey!